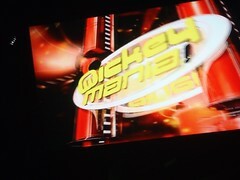 Mickey Mania is one of the evening game shows Mik and I went to on the cruise. Who Wants to be a Mouseketeer? 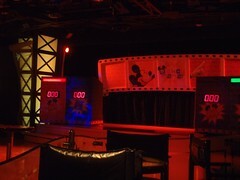 is still our favorite, but Mickey Mania was much better than the Pirate game show. It was at least Disney trivia. It kind if reminded me of playing Disney Scene It. The selection process is whoever the host decides to pick and again it was partially split with the kids club. The randomness of Who Wants to be a Mousketeer? is nicer. Plus, if you are not picked at the beginning your not going to be playing in this game at all. However, we didn't actually want to play anyways, especially since the podiums are up on a stage and wouldn't actually work with Mik in a wheelchair.